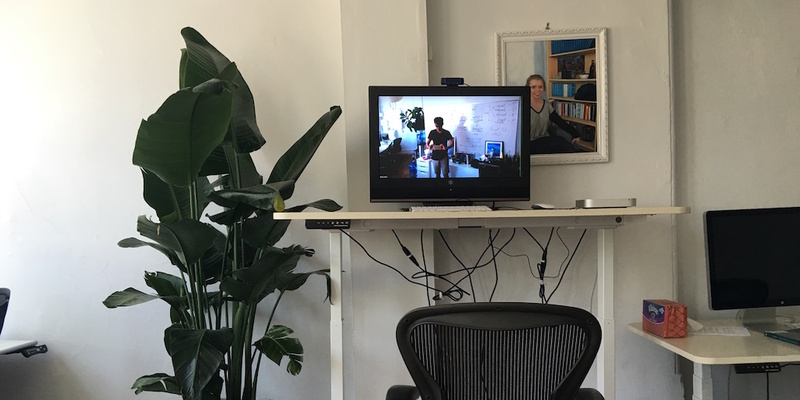 One of the most painful aspects of having a distributed or remote team is something that’s incredibly basic: video conferencing. Video calls are the main way to get face-to-face time with your colleagues in other offices or working from home, so you may be doing multiple calls per day. For each one, it takes at least 5 minutes to create the call, coordinate everyone to join the call, and get the audio and video working properly. A company of 10 where everyone does 5 video calls per week will lose over 200 hours of productivity per year due to setting up video calls. That’s why distributed companies like Foursquare have created an alternative to the traditional video call. At Foursquare, they use something that they call “The Portal,” which is an always-on video conferencing platform that’s constantly running 24 hours a day, 7 days a week, with one end in New York City and the other end in San Francisco. What you end up with is more than a video conference—it’s a gateway that gives you the ability to appear in the other office and work face-to-face just by walking up to the screen. Here’s how you can set a portal up for your own distributed company or remote team. The great thing about having a portal is that you don’t have to set up the call. It’s already there—you just need to walk up to the screen. Two-way: Both sides are joined in an always-on call. This is what Foursquare has, and it’s ideal if you have a distributed company with two or more major offices. One-way: One side has an always-on call running that anyone can easily join. This makes sense if you have a main office that’s your home base plus people working remotely. Many-to-many: There’s an always-on call that everyone in the company is a part of. This is for fully remote teams using their laptops from home. This makes the portal ideal for the following kinds of conversations. Because impromptu conversations are by nature not prearranged, they don’t come with pre-created video calls. One side has to, for example, go into Google Hangout, create the call, and invite the participants. Inevitably, the audio won’t work and the participants will have to restart Chrome. Before you know it, 5 to 10 minutes will have passed and you won’t have even talked yet. At Foursquare, they hold their daily standups in front of their portal. This relieves the daily burden of requiring both sides to dial in. The upshot is that standups are more likely to start on time and get done quickly so that everyone can get back to work. When you walk past the portal, you may bump into someone walking past the other side of the portal, even if you’re thousands of miles away. That creates the opportunity to stop and chat, just as you’d do if you worked in the same office. 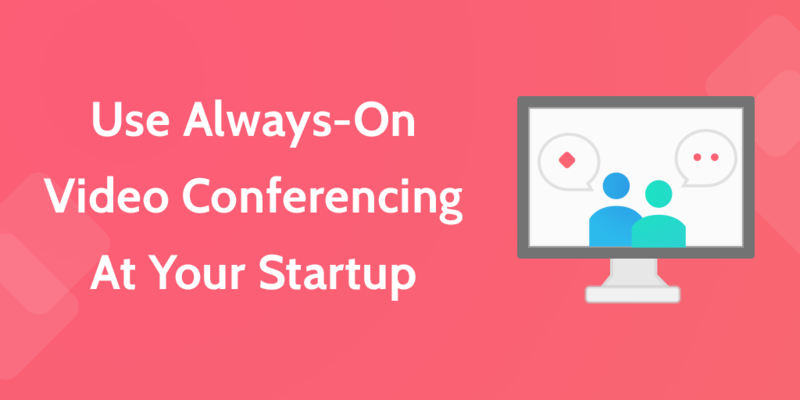 While the portal isn’t as useful for more heavyweight video conferencing that requires screen sharing or for meetings lasting longer than 20 minutes, it makes it so much easier for these lightweight and serendipitous conversations to occur. Foursquare uses fancy Cisco video conferencing equipment, but you don’t need to raise $166 million to be able to afford a portal. Even if you’re a bootstrapped company, you can put one together on the cheap and make your distributed company more efficient without breaking the bank. 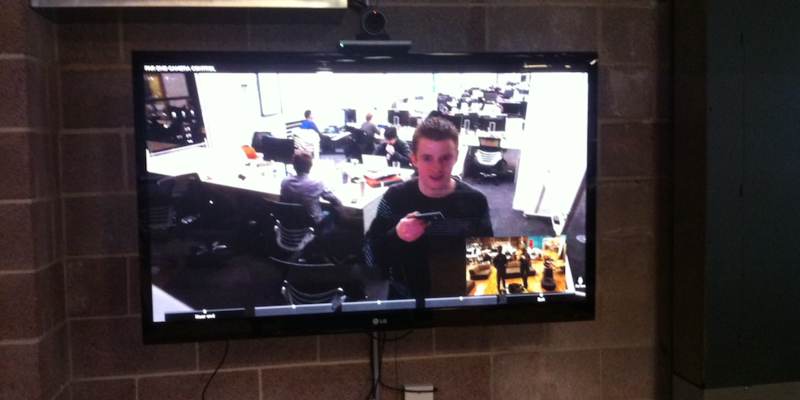 For a portal, however, size matters less than it does for your typical video conferencing set up. That’s because most video conferencing rooms are rectangular, with people sitting around a table at varying distances from the TV. If your TV is too small, the people in back won’t be able to see the screen clearly. If your TV is too large, the screen will be pixellated for those sitting too close. With portals, this matters less because they’re typically set up in the main area of an open-plan office. When people stand in front of it, they’re generally lined up at an equal distance from the TV. The upshot is that a 42” TV or greater is recommended, and you could make do going down to 32” or even using a large monitor in the 27” range. You definitely want a webcam that can capture high-resolution video in 1080p and widescreen video to get as much office in view as possible. Plus, for a portal, it’s essential that you get an autofocus lens. 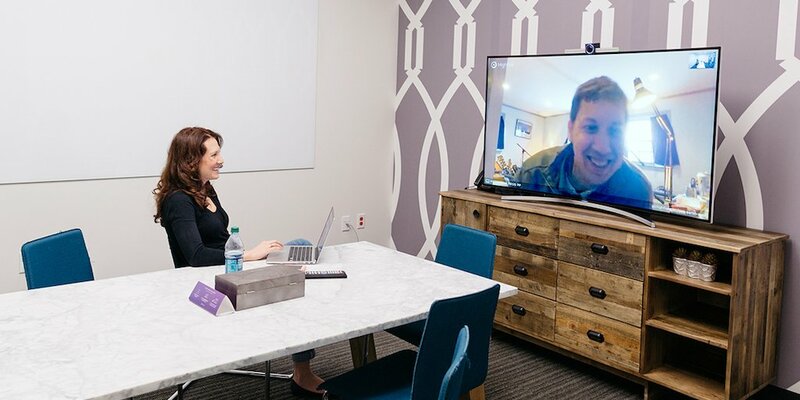 A portal video conferencing setup, unlike a traditional one with fixed seating in a conference room, is constantly being used by a changing cast of characters. One day it’s being used by the four-person engineering team for a daily standup. The next day, the whole company gets in front of it for the all-hands. That’s why the widescreen video and autofocus lens are so important—they make the webcam flexible and adaptable to a number of use cases. A popular webcam with these features is the Logitech HD Pro Webcam C920, a low-cost option that should do the trick for most basic setups. Audio is the most important component of a video call, but it’s often overlooked. Audio is the main channel over which information is conveyed—you can have a call without video, but a call without audio is totally worthless. The built-in mic on a webcam or laptop won’t be enough to do the trick. If you have meetings in front of the portal, you’ll have people standing at some distance away from the microphone on all sides. That means that you need an omnidirectional microphone, separate from the webcam, that can pick up audio at a greater distance and can deliver good quality even in noisy environments. Running a single always-on video conferencing channel is all you’ll be doing with this machine, so getting something cheap will do just fine. Chromebox: Small boxes that run Chrome OS and only cost $179. These can definitely run Hangout. Just make sure that the video call software you choose has a Chrome app or runs in the browser. Chromebox for Meetings is a bundle to run your video conferencing that includes a camera, microphone, and remote control. Mac Mini: Low-end Macs in an elegant form factor. Minis are still probably more than you want to spend only to power an always-on call, but if you have a spare one lying around, put it to work. Micro desktop: A cheap Windows machine that will be able to serve your needs and then some. The one thing to look out for is that, if your company is an Apple shop, it’ll be harder to debug any problems that do arise. All-in-one solutions like Highfive obviate the need for a separate machine to run the video conference. The device is mounted on top of the TV and contains a webcam, microphone, and all the processing power it needs to run video calls. Google Hangout is free, but you get what you pay for. Skype: Everyone has it, but people are used to using it in the consumer context where you call a friend as you would on the phone. Normal business features are available in Skype for Business, but its integration into the Microsoft suite of productivity apps is a bit confusing. 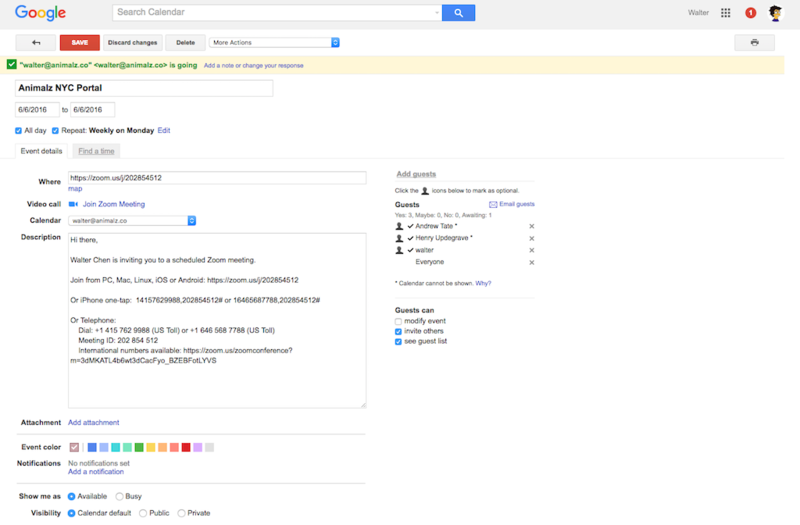 Zoom: Great Google Calendar integration for scheduling Zoom calls inside of Calendar, and it works cross-platform except on Chrome OS. GoToMeeting: Full-featured, but may be too heavyweight and clunky from a UI perspective. Once you’ve chosen the software, make sure everyone knows how to connect to the standing call easily. This is especially important in the one-way portal situation, where your remote employees are going to interact with the portal by joining it, rather than just walking in front of it. An easy way to do this is by creating a recurring weekly calendar event. It lives in each team member’s calendar so it’s always just a click away. Video conferencing eats up bandwidth like nobody’s business. There’s no way around it: if you want to have an always-on conference call that actually works, and you want the ability to make other video calls simultaneously, you need a high-speed internet connection. Internet speeds are often written in this form: 50×5. That means 50 Mbps download speed and 5 Mbps upload speed. Speeds are typically asymmetric, which means that download speeds are routinely 10x faster than upload speeds. The problem is that video conferencing requires beefy upload speeds because video files are so large. A minimum of 5 Mbps upload speed is recommended for high-quality video streaming. Here’s a sample table from Time Warner’s pricing in New York City. At minimum, you’ll want to be on 50×5, if not 100×10 or faster. Suppose that for your 10-person company, you’re wasting those 200 hours per year on time spent setting up video calls. At $50 per hour, you’re losing $10,000 per year in productivity. Putting together the solution above will run you about $2,000 per year on the higher end, which gives you huge gains. And that doesn’t even count the intangible benefits of less frustration and anger around having to set up calls with Google Hangout. By creating your own portal, you’ll build a happier and more productive company, and you’ll make distributed or remote work for you. We are building an enhance version of “the portal” not only including always-on video conference but also smart whiteboard function on 55 inch touch screen TV with built-in CPU and GPU running on android. If you are interested in it, please let me know. I am in SF bay area. Im interested in learning more! This all sounds exciting .. and just what I need. Our company will be moving to a new office location soon, but 1/3 of my team will remain in the old location. I would love to have an “always-on” communication portal so as not to lose the great communication that we have developed within our group .. and .. the rest of the company with the group that will now be remote. Would love to hear more! .. first steps .. etc? Very cool. I have also seen this put in place for customer service over long distance. This way if the tech team is at distance the walk in consumer can talk with the specialist far away. Would love to see comparison/update on the best quality solutions at lowest bandwidth. An always-on video conferencing portal seems to be a great idea, especially for large organizations that have to deal with constant meetings including boardroom meetings. Currently, I am using Vidyo video conferencing systems, which is although great for every business, I still don’t see any always on option but I believe they do offer it. Can anyone help me out with it? We have tried an always on point to point video connection for a few weeks. All works fine except that the Skype call has be to be repeated each morning. Even this small effort is too much if you want to have a virtual connection of two office spaces. The whole office (real + virtual) should just be there for you every morning. So if anyone knows how to achieve a truly permanent video connection at limited cost, I would be very interested (Skype or other solution). Hi “US” : Did you ever have any luck finding a truly permanent video connection at limited cost? I am working to build out an always on conferencing solution.